Episode 168 of Experiment is ready for your ears! Allex brought another load of deep/tech/tribal and progressive house! This time, more melodic stuff as usual and producers such as Tensnake, Mat.Joe, Vangelis Kostoxenakis, Rene Amesz, JJ Mullor, Bizen Lopez, Sam Arsh, or Eddie Thoneick. Enjoy! A warm welcome to another episode of Experiment full of new, fresh and classic deep/tech/tribal/progressive house by your host Allex. Tonight we have some thrilling high-quality music from artist such as Andre Lodemann, GruuvElement’s, Mike Newman, Chus & Ceballos, Adrian Hour, Dosem and many more! And here we have another strong episode of your fortnightly update of deep/tech/tribal & progressive house music! Experiment number 164 contains weapons from producers such as Sonic Future, Affkt, DeMarzo, Alberto Ruiz, Dario Nunez and many more! Enjoy! We always try to keep you updated with new and fresh deep/tech/tribal/progressive house mix called Experiment. This time, Allex your host, mixed more club tech house tracks to move your body and used tracks from artists such as Booka Shade, Pete Oak, Oscar L, Eddie M, Leo Lippolis, Green Velvet or Harvey McKay! Enjoy! Episode 162 of Experiment is here again! After two weeks, Allex had good time to find fresh and cool new music for his one hour mixing session and it’s here. You can expect names such as Dinka, Jaceo, Supernova, Riva Starr, Oscar L, Julian Jeweil and many more! Latest episode of Experiment is here! And it’s a bit special one! As we are probably all aware, Allex the host of this podcast is going to launch his own Record Label – Experiment Records. The first release of the label will be his own EP called House Machine and here it is, two of the tracks of the EP are included in the 161st episode of his podcast! Also tracks from the names such as D-Formation, Bicep, D.Ramirez, Kintar, Tiger Stripes, Mark Knight and much more! Enjoy! 12. Mark Knight – VoulezWho? Allex has prepared another one hour mix full of deep/tech/tribal and progressive house music for your ears! 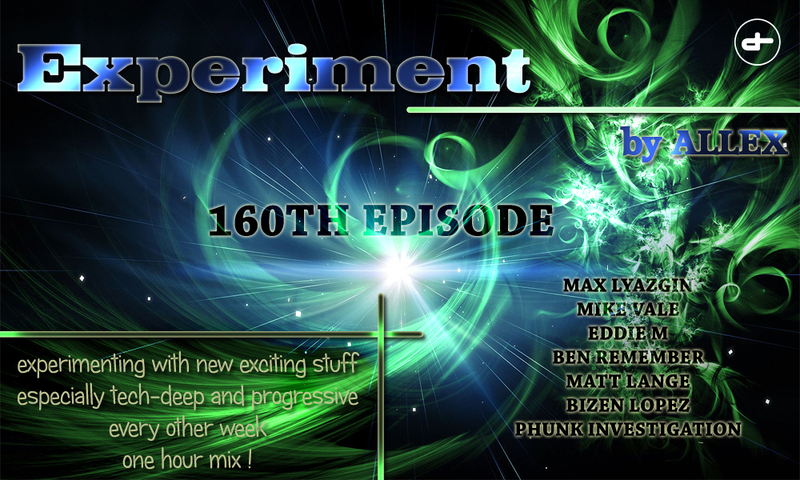 In tonight’s Experiment you can expect names such as Max Lyazgin, Mike Vale, Eddie M, Ben Remember, Matt Lange, Bizen Lopez or Phunk Investigation! So don’t hesitate and check it out! 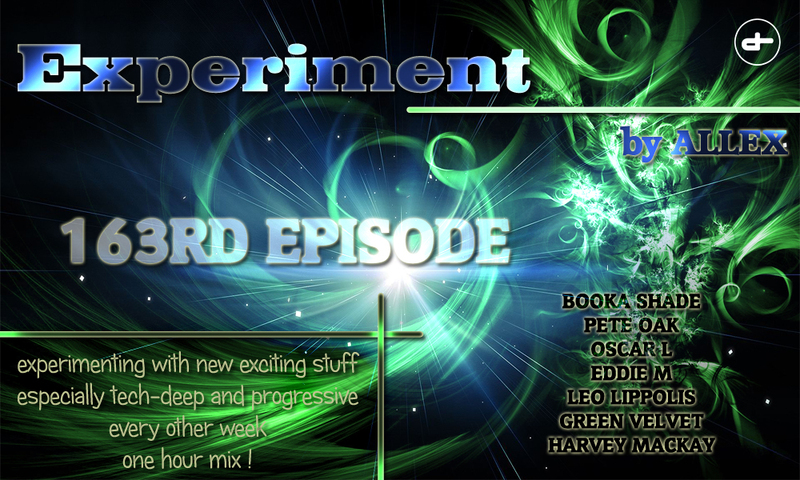 Experiment is back as usual, after 2 weeks with another load of deep/tribal/tech and progressive house music! One hour mix made by your host Allex full of latest bombs from artists such as Kellerkind, Mat.Joe, Vicetone, Sonny Wharton, Jay Lumen or Sebastian Xottelo! So don’t hesitate, sit back and enjoy! Episode 157 of your fortnightly update of deep/tech/tribal and progressive house music is here again. Allex brought another of his Experiments so let’s go what to expect tonight. Dosem on his new label Houstrike, Marco Lys, Ben Remember, Prok & Fitch, Alberto Ruiz, Ramiro Lopez or techno master Drexler! Enjoy! Warm welcome to another update of deep/tech/tribal and progressive house by your host Allex. In this episode of Experiment you can expect more melodies that usual, sunny summer tracks full of beachy feelings or massive groovy creations and also Allex’s brand new remix from his studio! Artists included Saccao, Alex Kenji, Stamen, Phunk Investigation, Mat.Joe and many more! Enjoy! And here it is another episode of your fortnightly update of tech,deep,tribal,progressive house! Experiment as the podcast is going to be transformed into a bigger thing and after the long years of success and changes, it’s time to make it as a brand. Or as a part of a brand. Allex decided to launch a Record Label simply called Experiment Records which hopefully release first tracks in summer 2016! Experiment as a podcast will stay as it is, just it will be more joint to the Records as Label Showcase. Everything is in the plan now so expect big progress. For now, enjoy another hour full of music which you can expect to be releasing on Experiment Records! 154th Episode of Experiment, your fortnightly update of deep/tech/tribal/progressive house music is here! Allex brought you again some unusual stuff and also usual dancefloor killers by artists such as Journeyman, King Unique, Mihai Popoviciu, Vangelis Kostoxenakis or Eric Prydz! This time, you can expect something from Allex’s own studio and that’s his upcoming melodic track Hot Paradox, dedicated to summer feelings, due on 24th February! Enjoy!